Millions of people around the world are fleeing their homelands to escape war, genocide, torture and persecution. Most recently the Australian Government has stepped up to save the lives of 12,000 people escaping war in Syria. During the month of October I’ll be donating 10% of the proceeds from my original artwork sold to Amnesty International, a global movement that works to uphold the rights of people seeking asylum across the world. Amnesty uses funding to place researchers on the ground in conflict areas to expose human rights violations, lobby governments, corporations and international bodies to champion human rights, fund campaigning in Australia to dispel myths about refugees and more! If you’d like to purchase an original piece of art for a good cause please reach out to me directly at artist@kimleutwyler.com! 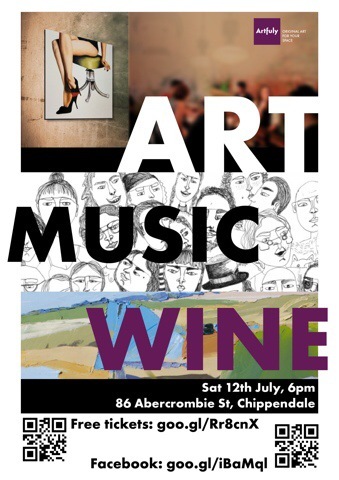 Come along for my opening night on 12th July in Sydney with art from 17 artists, music from Mnmlych and Ben Richards, select wine and a digital discovery experience (bring a smartphone or tablet to open the virtual doors behind each original artwork). RSVP essential at Artfuly’s Eventbrite page and share with your friends using the Facebook event.